Once-and-Future Actor Credited with Saving Lives in Santa Paula. Edwards returned to the screen in the 1940s. Photo courtesy of Jack Tillmany. Although the life of Thornton Edwards would make a riveting film, chances are the real-life "Hero of the St. Francis Dam Disaster" and B-movie actor would never have been considered for the starring role. Born in 1894 to genteel Maine privilege, Thornton graduated from an exclusive private school in 1915; the following year was inexplicably in Hollywood, and his first film was released the next year. Thornton's Western career started early, his dark, not-quite-but-verging-on-handsome good looks more than suitable for his early roles in the 1917 silent Western, "The Learnin' of Jim Benton" and in 1918, "The Gun Woman," the latter starring the "Hello, suckers!" flapper Texas Guinan. Soon the dark, indeterminate ethnicity of Thornton's features led to many varied roles. Although initially receiving if not top, then at least top-tier credit in a variety of films, by 1921 Thornton — married to a woman who claimed a Mack Sennett Bathing Beauty pedigree — was appearing in comedy shorts. By 1922, Thornton was a motorcycle cop in the San Fernando Valley, and he joined the Santa Paula Police Department a few years later, then left to become a State Motorcycle Officer, the precursor to the California Highway Patrol. By the time the sun came up March 13, 1928, Thornton was the "Hero of the St. Francis Dam Disaster," a role even he could never have imagined when the churning waters of the great dam east of Santa Paula were released by its collapse in the dead of night. As many as 1,000 people were killed as the flood — by the time it reached Santa Paula, a semi-solid mass of bodies and debris — made its deadly, 56-mile way to the Pacific Ocean. Thornton made sure his wife Ethel and their young son were safe before he tore off on his Indian motorcycle to warn as many Santa Paulans as he could that death and destruction were headin' to town. At one point, the waters swamped his motorbike, and Thornton had to make a quick repair before again riding off into the night. Although there were many heroes of the St. Francis Dam Disaster, there was something about Thornton — perhaps his square jaw, dazzling smile and the quiet dignity and pride conveyed when in uniform — that caught the imagination of the public. His cap firmly set upon abundant dark hair and the mustache that emphasized perfect teeth were the ideal match for the shiny badge, Sam Browne belt, laced boots and jodhpurs that finished the picture of the man who steeplechased a disaster — and won. Thornton became the first person in the state to receive a Medal of Meritorious Service for his heroic efforts, and by the end of the year he was Santa Paula's police chief. It's a role he probably could have played forever, but the marquee of life had something else in store for Thornton, who was fired a decade later. Thornton jumped back into films, and the allure of acting in Westerns was soon satisfied; after all, Thornton's own history already included that Indian motorcycle. Thornton got some pretty good billing in B-movies and even small, often uncredited work in "A" films. But his forte soon became playing B-Western buffoons or banditos, the latter either firmly on the "bad man" side of the law, or a good man forced into badness due to cinematic circumstances beyond his control. In at least one film, the 1940 Hopalong Cassidy classic, "Three Men from Texas," Thornton was offered the chance to right that wrong. 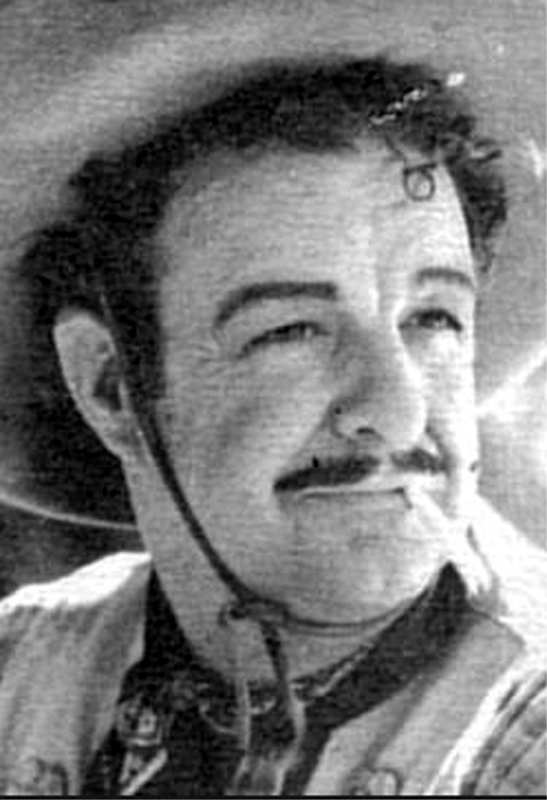 From the dignified Captain Rodriguez in Gene Autry's "Down Mexico Way" (1941) to the ultimate evil bad man Tronco in 1941's "Silver Stallion," Thornton's career seemed to be on its way, with dozens of film appearances in less than a decade. Thornton, an excellent horseman still willing to tackle stunt work mastered early in his career, was reunited with "Hoppy" in several films and also appeared with Whip Wilson. But as the century crawled toward its mid-mark, his career — more than 60 films, and more credits surfacing all the time — was pretty much over. Thornton died in 1988 at age 93 in Tulare County, Calif.
"The Warning" by Santa Paula sculptor Eric Richards, as seen in 2018. Click to enlarge. 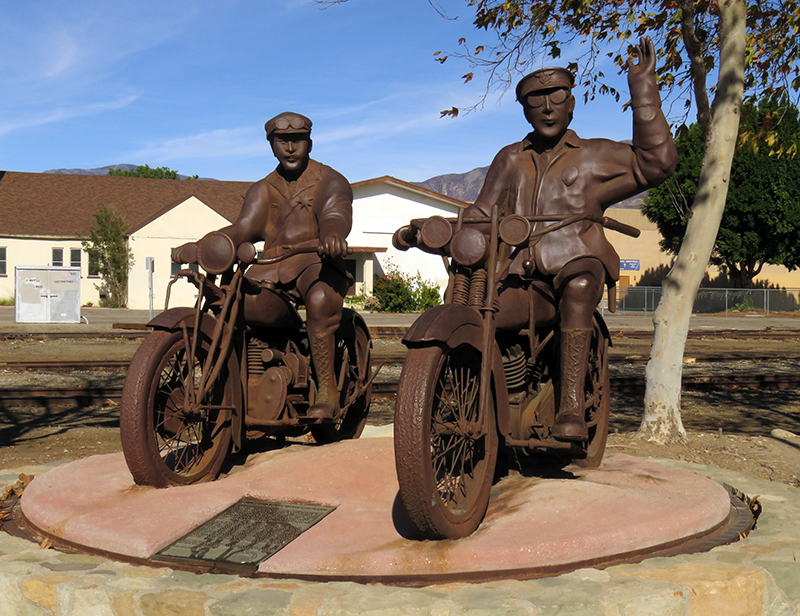 On a busy corner in Santa Paula — and visible from my home — is "The Warning," a bronze statue of two motorcycle officers meant to honor the heroes, survivors and dead of the St. Francis Dam Disaster. From certain angles, the statue "shot" is framed by railroad crossing arms, one of the two bronze characters seeming to look back at me through the distance. Always modest about his role in the disaster, Thornton probably would have objected when it was proposed that the symbolic statue be of him alone. He needn't have bothered: Several dubious public accusations abruptly changed the work to two anonymous motorcycle officers. Although the one astride the Indian undoubtedly is Thornton while another officer, Stanley Baker, rides the Harley, neither hero garners credit for his role. It was Thornton's last chance at finally getting that top billing. 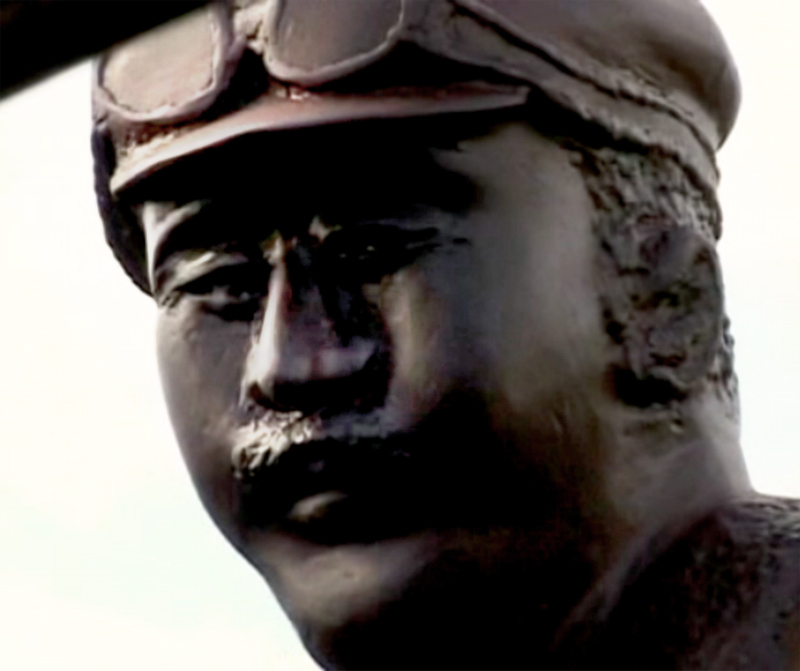 > Watch the 2003 unveiling of "The Warning" at the end of this video.